There are many perks to living in a small mountain town such as Vail or Breckenridge, Colorado. Many will come, but few will stay and root their lives to become a townie. We call it Mud Season. Ski season is over and tourists flock back to reality while the locals enjoy a moment of peace and quiet. This is when businesses provide locals appreciation with great promotions to restaurants, retail, etc. Discounts are popular because they work. Especially in local markets with fierce competition. 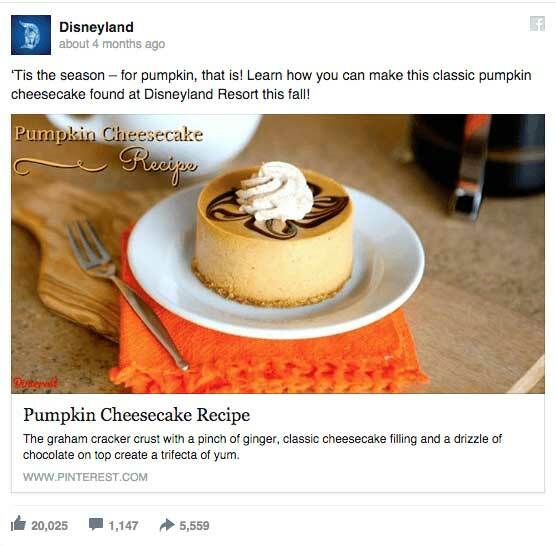 And it is often that locals will already be following their favorite local brands online, so if you’re running an off-season special, don’t forget to promote your discount to your existing online audience. 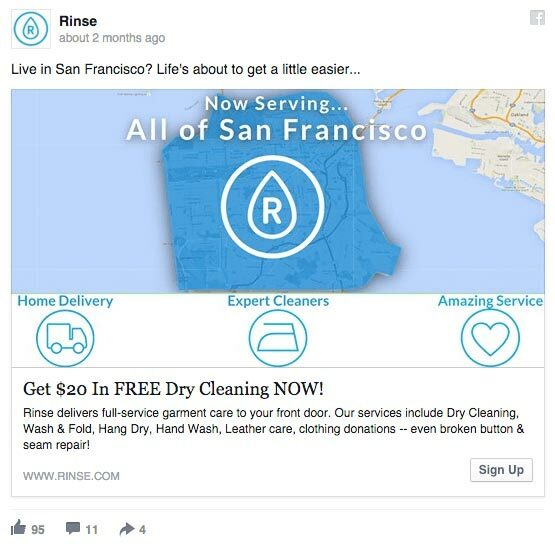 Rinse is a local dry-cleaning service in San Francisco with a primary value proposition of convenience. You’ll notice the ad copy helps push a simple discount people can redeem immediately. Discounts can be a great way to get people in the door. 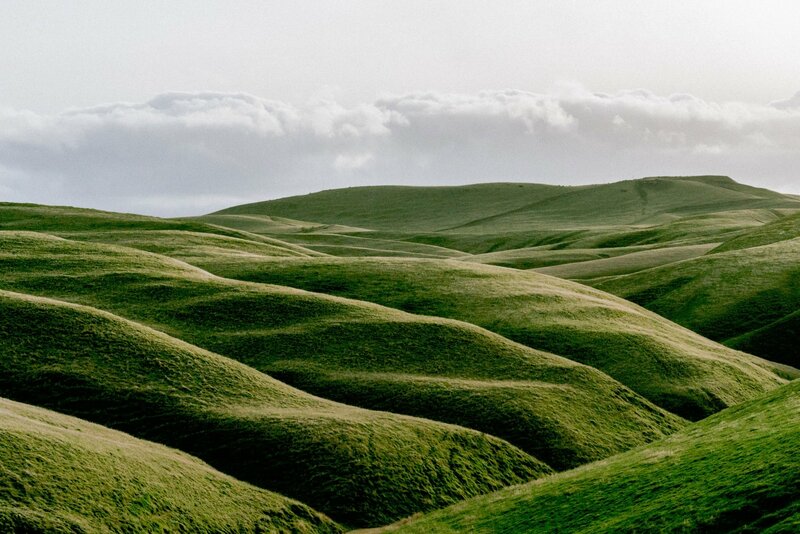 Your goal will be to convert a healthy amount of these customers into long-term ones. 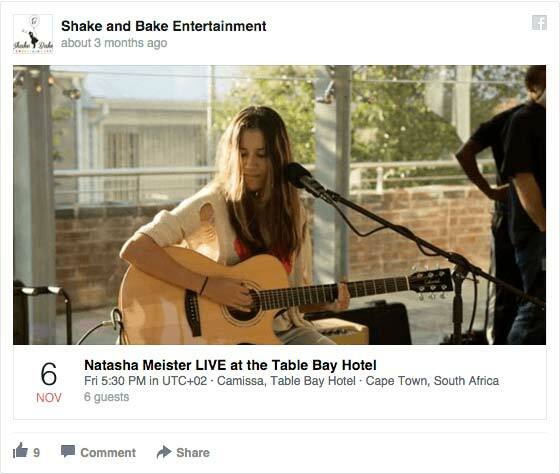 Events present one of the best opportunities for local advertisers. It allows attendees to interact with your brand and get the full experience. It’s often a good time to gain leads with a raffle or giveaway by collecting new email addresses. Set up a booth and provide a fun experience to connect with a new audience. There’s always free concerts to enjoy during peak season so why not piggy back off that event by driving foot traffic to your business? Shake and Bake Entertainment follows this model. 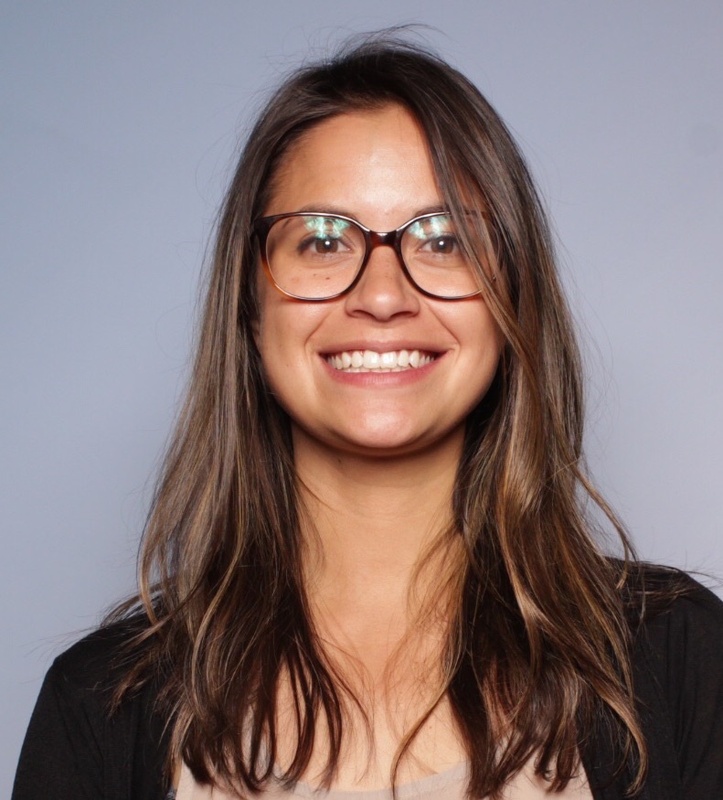 The value proposition is pure talent which means the Facebook local ad creative can be simple and clean keeping focus where it should be (the person people want to see) while minimizing focus on the advertiser. 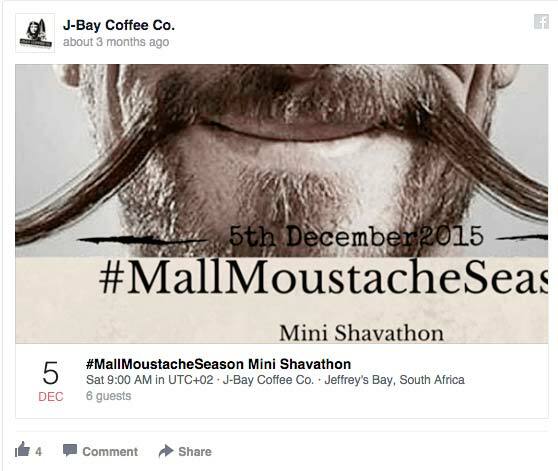 J-Bay Coffee held a one-day mini shavathon with the hashtag #MallMoustacheSeason. Their target audience must be trendy hipsters or something. This is a fun and engaging way to get people talking and in the door! 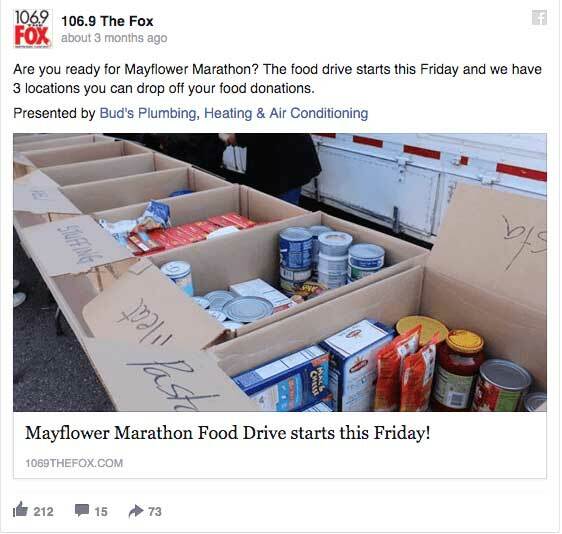 Host an event and give back to your community. Not only will you continue to build trust, but I bet you’ll get more participants to join your brand if you can find common passions to identify with. You need to stand out from your competition. These next few examples build on that theme, avoiding price competition and highlighting key differentiators to stand out. 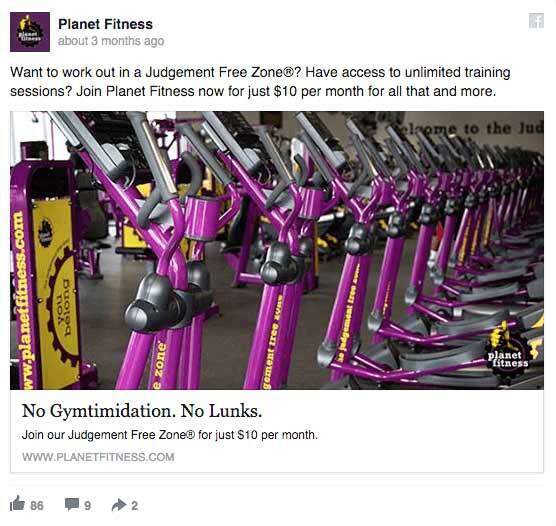 Planet Fitness is using the term ‘Gymtimidation and Lunks’ to position themselves to their audience and clearly stating who they’re NOT for. Their registered tagline continues to build on that theme by promising a nonjudgemental workout environment. Who enjoys packing and moving? Nobody. 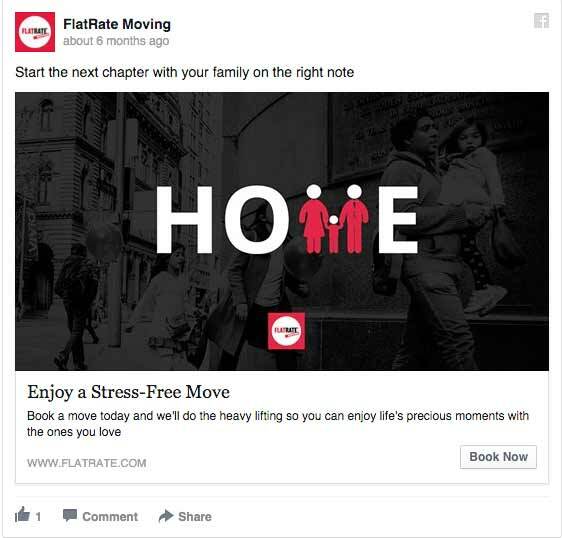 FlatRate Moving wants to remove the stress associated with moving by having them deal with all the negative aspects. The entire ad reinforces this message. If I were about to move, checking out their services seems like a no-brainer to me. A lot of locals actually visit Disneyland multiple times each month. And what gets them to come back? How about a delicious, seasonal treat? In this ad they are using content to remind you of the amazing experience you had and you can’t wait to come to have it again. This is a great local ad example sponsoring charities which can help provide a huge credibility boost. It’s a great opportunity to work alongside local media, increasing brand awareness and assuring people that they’re someone to be trusted. Website visits are great but at the end of the day, people walking through the door is the lifeblood of many local businesses. 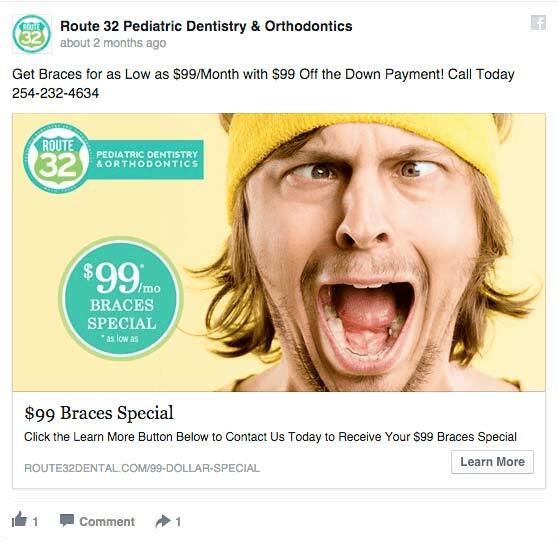 Online tools can help, especially if you’ve been able to pick a few ideas from these Facebook local ad examples. The trick is to know how this fits into your sales funnel. Getting the right targeting setup properly along with some of these creative ideas will ensure that your ad dollars are well spent. Not sure how to manage Facebook ads? Interested in partnering with a local brand to increase your exposure? Contact our team at Swift Local Solutions to find out more about our different solutions that include facebook advertising tips that will help you grow your audience.